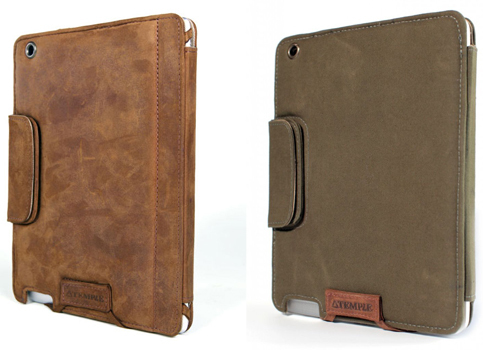 These expensive vintage leather and WWII canvas folio-like cases for the iPad 2 look like something Indiana Jones would use. Temple Bags' iPad 2 Leather Smart Case and iPad 2 Smart Case folios have back facing camera cutouts, horizontal viewing and tabletop typing stand capabilities as well as a magnetic closure system. Don't expect these to come cheap, if you're feeling leather is your material of choice, the iPad 2 Leather Smart Case will set you back $199 while the iPad 2 Smart Case will set you back $179 of your hard earned cash. Vaja isn't the only expensive case maker on the block. Check out the video right after the jump.